With my family, Christmas is a celebration that fills our house...inside and out. We have Christmas trees - that vary in size - for every room of the house and a Snow Village &apos;town&apos; that lights up our living room. Yet, for all of the decorations that we cherish and display each year, it&apos;s been more than 15 years since we&apos;ve had a real, live Christmas tree. Back then, my oldest son was just 5 years old, but we had an experience that makes me laugh even now. When we went to cut down the tree we had selected, I got down on the ground to get underneath it and Blake decided he would "help" and sat down on my legs. You had to be there to see the expression on his face but, like I said, it was something that we still talk about at Christmas time. When it came time to make our plans last year, our younger son Daniel said he&apos;d like to have a live tree for a change, so we headed to Evans Whispering Pines Christmas Tree Farm in the country just west of Danville, Indiana. About 3 years ago, we visited the family-owned farm and purchased one of their beautiful handmade wreaths. They have so many to choose from, yet each one is designed with a personal touch that made the one we selected truly unique. Located at 1538 N. County Road 400 West, Joe and Rita Evans started growing trees in 1983 and began selling them in 1989. Spanning more than 50 acres, the fields are filled with row after row of Scotch and White Pine trees. They provide saws if you want to cut down your own tree. If you prefer to get your Christmas tree "to go," they have a nice selection of pre-cut Frasier and Douglas trees at the barn for your convenience. 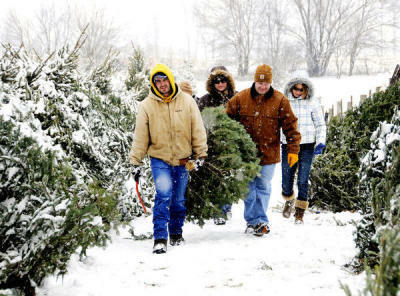 The Evans Christmas tree farm is open daily for the season the day after Thanksgiving through Dec. 21. They have new hours this year. The family farm will open for business from 1-6 p.m. every day but Saturday. On Saturdays, they extend their hours to 9 a.m.-6 p.m. If you&apos;re buying a wreath or garland, everything is freshly made. If you call ahead, they have larger sizes of wreaths available for you to order. One of the things we noticed when we were there is the Evans family takes a great deal of pride with their customer service. If you need any help from hauling the tree from the field to making sure it&apos;s properly secured to the vehicle you&apos;re driving and everything in between, they&apos;ve got you covered. They also put each tree on a shaker to remove any dead needles and they take care of drilling a hole in the base of the tree so that it&apos;s fits perfectly if you&apos;re using a stand-straight stand. While you&apos;re there, they have plenty of free hot chocolate, coffee or hot tea and free coloring books and candy canes for the kids. You&apos;ll also want to make time to visit with some of the animals, including Macey the pony and Buddy the miniature donkey. 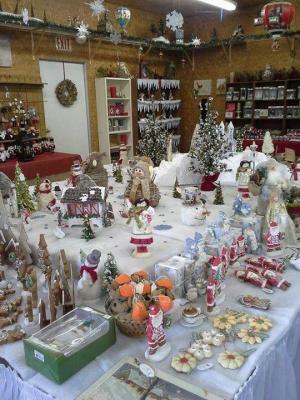 Inside their gift shop, they offer a wide assortment of holiday decorations and gifts. The first two weekends in December, Santa will visit the farm from noon to 4 p.m. on Saturday and 1 to 4 p.m. on Sunday. If you need directions or more information, visit their website or call (317) 745-3146. Don&apos;t finish your holiday decorating without a visit to Evans Whispering Pines!